"No artificial ingredients. Cream cheese pastry filled with raisins, nuts and cinnamon. Naturally sweet." Cream together the margarine and cream cheese in the bowl of an electric mixer. Blend in the vanilla. Mix in the flour. Chill the dough. To make the Filling: Mix together the chopped raisins, chopped walnuts, and cinnamon. If you have a food processor, place the whole walnuts and raisins into the bowl, sprinkle with the cinnamon, and chop them together by processing in short pulses. Divide the dough into 4 equal portions. Roll out each portion into a 10 - 12 inch circle 1/8 inch thick on a lightly floured board or between two sheets of waxed paper. Spread a light layer of preserves (approximately 2 tablespoons) onto each dough circle. Sprinkle each circle with approximately 1/4 cup of the chopped nut-raisin-cinnamon mixture. Cut each circle into 16 wedges using a pastry cutter or a pizza cutter. Roll each wedge from base to point. Place point down on a lightly greased or parchment lined baking sheets. Bake for 15-17 minutes at 375 degrees F (or until golden). Remove to racks to cool. 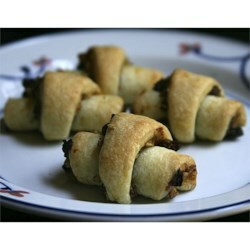 See how to make traditional rugelach with walnuts and raisins. Although easy to make, it was too doughy for our tastes. I rolled the dough thin and it took twice as long to bake. The end result was light and dough-tasting. These are great but they are not for diabetics. Grains are as bad for a diabetic as sugar and that includes flour.